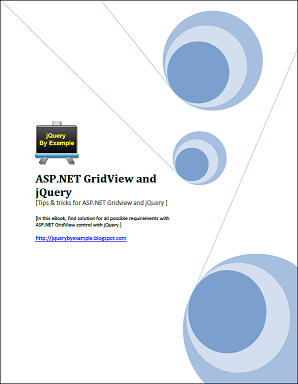 Being an ASP.NET developer and fan of jQuery, I had put together all my real life experience with ASP.NET GridView Control and jQuery and complied them in my first ever eBook named "ASP.NET GridView and jQuery Tips and Tricks". This eBook takes you through 16 different, useful, tips and tricks and offers solution for all possible requirements with ASP.NET GridView control. This is a point to point eBook with detailed explanation of code. Along with this eBook, code samples are also attached. This eBook was not possible without my blog readers and followers. Your continuous support is encouraging and motivates to do more good things. "Thank You".